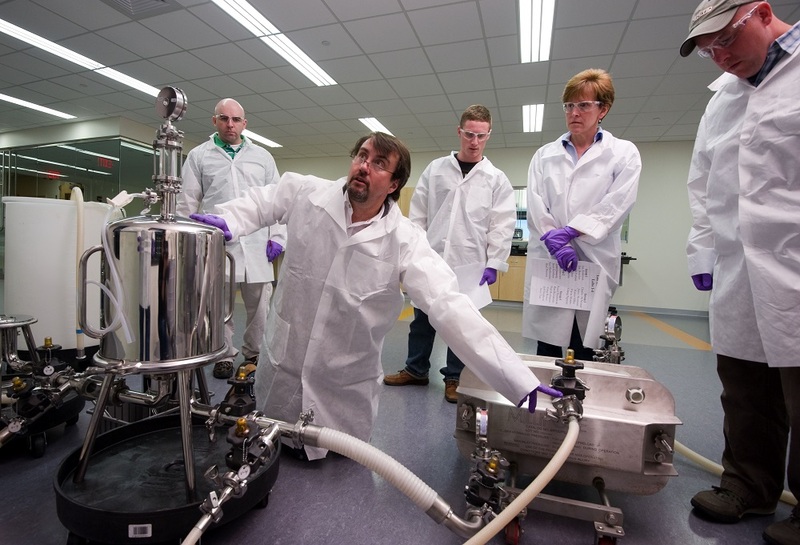 Biotech professionals are trained at WPI’s Biomanufacturing Education and Training Center. Worcester Polytechnic Institute (WPI) today announced it is now a member of eight far-reaching institutes that fall under a public-private partnership known as Manufacturing USA. The partnerships build upon WPI’s 150-year commitment to advancing manufacturing. aircraft aluminum alloy in Washburn labs. The shared goal of this initiative is to “secure the future of manufacturing in the U.S. through innovation, collaboration and education.” Manufacturing USA brings together industry, academia and federal agencies to increase manufacturing competitiveness in the United States and promote a viable manufacturing infrastructure. The network encompasses 14 institutes established to date that focus on a range of areas, including material processing, robotics, biotechnology, and sustainable manufacturing. “Manufacturing USA is all about establishing new pathways for academia and industry to partner on applied research and advanced workforce skills,” said Mike Molnar, director of the Advanced Manufacturing National Program Office (AMNPO), an interagency team that operates the Manufacturing USA network and is headquartered in the U.S. Commerce Department’s National Institute of Standards and Technology (NIST). WPI President Laurie Leshin said the university’s leading role with Manufacturing USA is in keeping with its heritage. “WPI was founded more than 150 years ago to support education and workforce development during the industrial revolution, and we look forward to driving innovation, career development, and other techniques to support 21st century manufacturing initiatives,” she said. The institutes are public-private partnerships, established with a five-year “start-up” cooperative agreement from a sponsoring federal agency. The typical institute award is $70 million, which must be at least 100 percent matched with non-federal support. Overall, industry and other non-federal sources have invested twice as much in the program as has the federal government. Sponsoring agencies include the Department of Defense, Department of Energy, and Department of Commerce. Bogdan Vernescu, vice provost for research at WPI, noted that federal agencies issued a call for proposals for the institutes over the past several years. In turn, WPI partnered with other academic institutes to answer the need and were named on the winning proposals. Vernescu said it is unknown at this point how much money WPI will receive in the process, but that its involvement holds promise. “Participation in these institutes will contribute to the growth in our research funding and lead to regional economic development,” he said. He added that the partnerships are key for success. “We’re eager to partner with industry and other universities to develop solutions and products that transform manufacturing in the United States. WPI has the ingenuity and expertise to make a significant impact nationally,” said Vernescu. Lightweight Innovations for Tomorrow (LIFT), according to Manufacturing USA, “is working to develop and deploy advanced lightweight materials manufacturing technologies.” LIFT, created in 2014, is the first institute with which WPI was involved. Rapid Advancement in Process Intensification Deployment (RAPID) convenes companies, universities, and labs “…to focus on new technologies” that conserve energy and creates savings. To read a Q&A with Bogdan Vernescu about WPI’s role with manufacturing, visit WPI’s “Advancing Manufacturing” page.